The U.S. Mint sent out a notice today that provided a couple of notable updates to its product schedule. Two of 2016’s most anticipated items, the Standing Liberty Quarter Centennial Gold Coin and the 30th Anniversary American Eagle Silver Proof Coin, will debut on September 8 and 16, respectively, though the Mint’s online schedule does not yet reflect this new information. The 2016 Standing Liberty Quarter Centennial Gold Coin will be the second of three 100th-anniversary issues re-imagining classic 1916 circulation coins in gold. The Mercury Dime Centennial Gold Coin debuted on April 21 for the cost of $205 and went into “Currently Unavailable” status in less than an hour. 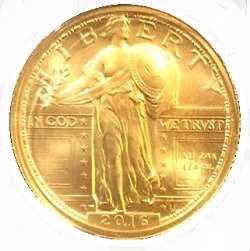 If the gold Standing Liberty Quarter were released at gold’s current $1,350-per-ounce price-point, it would cost $497.50, according to the Mint’s pricing chart for this year’s centennial gold coins. The 30th Anniversary Silver Eagle Proof Coins have gotten a late start this year, as the Mint has had to adjust its design to include a smooth edge with lettering, mandated by a law passed late last year. This is an important release for the Mint in part because Proof Silver Eagles are routinely one of its best-selling products, often seeing as many as 10,000 orders a week. A release date for the Uncirculated version of this coin was not included in the notice. More information on these issues will be posted as it becomes available.